This slightly off center bento picture is brought to you by nearly missing the bus this morning! I just couldn't let it go without getting my picture, and Kidlet made it just in time. 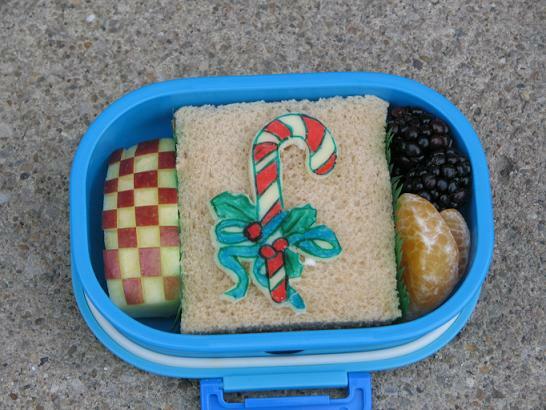 Also a smaller bento today because it is the Winter party at school so he will be stuffing himself with junk and will undoubtedly ignore his lovely healthy lunch. That is so cute!! I hope he ate it, right alongside the popcorn-cookies-gummy worms etc. LOL, yeah I down-sized lunches too the last few days before the holiday. You always have such detailed drawings. How long does a set of food markers last you?